There are polarizing foods out there, to be sure. Plenty of people aren’t fond of the spongy texture of mushrooms, the iron sweetness of beets, the bitterness of eggplant or the funk of cabbage. To the dismay of salsa lovers everywhere, we for whom cilantro tastes of soap walk among you. We form allegiances based on these preferences, collectively incredulous when people we thought we knew well reveal their inability to tolerate our very favorite food. But there is one flavor that elicits a stronger response than almost any other: the heat of chili peppers. To their fans, chili peppers represent an amazing variety of flavors that add interest and distinctiveness to cuisine from all over the world. But for those with low tolerance for spice, chili peppers seem to lurk alongside genial bell peppers at farmers markets, sinister, waiting to be mistaken for sweet instead of hot. Like storybook villains, hot peppers aren’t evil, but misunderstood, and learning a little about them might be enough to convince even the most timid to give them a chance, either in the kitchen or the garden. Beyond their dynamic culinary uses, there are potential health benefits to incorporating some hot peppers into your meals. Capsaicin, the antioxidant present mostly in the seeds and white membranes of hot peppers, binds to pain-receptors in our mouths, which we experience as that particular “hot” sensation. Hot pepper varieties are each awarded a different number on the Scoville scale based on how much capsaicin is present. Studies have shown consumption of the capsaicin in hot peppers to increase blood circulation, decrease cholesterol and triglycerides, and reduce the risk of stomach ulcers. Plus, our bodies produce endorphins to combat the effect of capsaicin, which, once the initial burn has worn off, can leave us feeling especially relaxed and even euphoric. Fresh peppers will have smooth, firm skins and stems that appear juicy, not dried out. Almost any variety of hot pepper can be eaten when young and green, though different varieties will take on fantastic orange, red, or even purple hues as they ripen. Ask your grower for suggestions on how he or she uses each one. “Hot peppers are actually a lot easier to grow than sweet peppers,” says Barry Savoie, of Savoie Organic Farm in Williamstown, N.J. “Sweet peppers are finicky. If you don’t have enough magnesium…potassium… [and] calcium in the soil you get a lot of blossom-end rot.” Hot peppers, on the other hand, tend to be a little tougher, to the point that even novice gardeners will succeed with them. The plants are often compact, requiring little real estate, and even one plant can be prolific, fruiting for weeks and producing an astonishing volume relative to the size of the plant. Even better, chilies love when the soil warms up, so they’re ideally suited to container gardening. They should be watered when it gets quite hot, but they’re positively hardy when compared to other, more high-maintenance annuals. Despite this hardiness, Savoie supports his hot pepper plants with stakes, “like you would a tomato, [because] you get a lot better yield,” since the plants can focus on fruiting instead of developing as supportive a root network. This year Greensgrow Farm in Kensington sold seedlings for a great variety of peppers, including bright orange Bulgarian carrots, Ho Chi Minh, Jwala “finger hots” from India, yellow Hungarian wax, a variety of New Mexico anaheims called Joe E. Parker, Cherry Bombs and Red Rockets, a type of Serrano. The astonishing variety of chili peppers — which originated in present-day Bolivia and now boast diverse cultivars all over the world — is enough to dazzle any cook. Late-summer hits and peppers abound in a tumble of red, yellow, orange, and green. More than almost any other item at the farmers market, they are the biggest bang-for-your-buck local food, often available in far greater quantities than even hot pepper fanatics (who sometimes refer to themselves as chili-heads) know what to do with. Chili-heads aside, home cooks often stick to familiar territory when it comes to hot peppers. We might play it safe with the mild heat of poblanos, up the ante with serranos or jalapeños (or their smoked version, chipotles), and only venture to try another variety with caution and a specific recipe in hand. Our loyalty to these few varieties mean that even in well-stocked grocery stores, it can be difficult to find any other chilies, though they are a fruit with endless variation and subtlety. Fortunately for the curious, small-scale growers have more freedom to experiment than big industrial producers, and farmers markets offer interesting gems whose heat levels fall in the same range as our familiar standards. While hot peppers may never be the staple that sweet peppers are in terms of getting quick, seasonal meals on the table, they don’t have to be — if given a chance, they can provide something even better than convenience: inspiration. Instead of grilling up another chicken with your standard barbecue recipe, try making a Peruvian-inspired sauce using Savoie’s aji amarillos. Do your best to one-up DiNic’s and grill your own long hots for pork sandwiches made with pastured pork from Sweet Stem Farm. A splash of fish sauce and a chop of chili transform a simple cabbage slaw into a local twist on Thailand’s som tam, a green papaya salad. Chef Tim Spinner, of La Calaca Feliz in Fairmount and Cantina Feliz in Fort Washington, uses both fresh and dried chilies to flavor countless sauces at the two restaurants. His house recipe combines dried pasilla di Oaxaca chilies with grilled tomatillos, garlic and tomatoes into a rust-colored, smoky and tart salsa. Prefer something hotter? 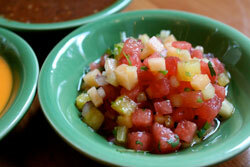 You’ll be delivered a dish of smooth, orange habanero salsa that is bright, citrusy and definitely spicy. Chef Spinner developed this fruit salsa recipe — a Grid exclusive — which balances the heat of chili against the sweetness of fruit. Though the recipe calls for jalapeño, feel free to substitute any hot pepper you like. Toss all ingredients together, adjusting seasoning with more lime, salt or chili as needed. Cover and let stand at room temperature for at least 15 minutes. Chilies are among the easiest foods to preserve — good since even spice lovers can only eat so many of them fresh. You can air-dry small, thin-walled peppers by stringing them into a garland. (Poblanos and jalapeños are usually too fleshy for this method.) Simply thread a needle with heavyweight thread and push it through the stem end of a chili. Tie a small knot around the stem to hold the chili in place, and thread a second chili in the same method, leaving enough space in between so they don’t touch. Repeat until you have a few feet of garland, then hang in a warm, dry spot with good air circulation. Allow chilies to dry until leathery and firm. Then, cut chilies off and store in an airtight container. Rehydrate as needed by simmering in water.